"Okay, you two, we have to work on the scene where you meet up." SIR TOBYArt thou good at kickshaws, knight? SIR ANDREWFaith, I can cut a caper. SIR TOBYAnd I can cut the mutton to't. SIR ANDREWAnd I think I have the back-trick, simply as strong as any man in Illyria. SIR TOBYMy very walk should be a jig. Shall we set about some revels? SIR ANDREWWhat shall we do else? SIR TOBYLet me see thee caper. Ha! Higher! Ha! Ha! Excellent! Geoffrey, Luis and I are on our way to the library for a serious look at a couple of buddies who drink, dance and flirt with chambermaids. Lifelong lessons. If this doesn't help them at college, I'm at a loss. "Look at these words, guys: kickshaws, caper, mutton, back-trick and jig. And can anyone guess what revels are?" "Alls I know is I'm pretty drunk," offers Geoffrey, and he weaves around the library like a Saturday-night sailor on leave. "And I like bear-baiting," Luis follows-up with a twinkle, his fingers clutching the air like paws. 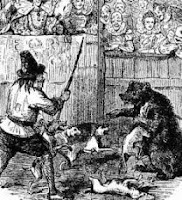 Luis and I had previously chatted about the sick blood sport of an idiot teasing a bear in a cage to enthrall a crowd hungry for gore. Where ten-year-old Geoffrey picked up his intimate knowledge of inebriation is something I'm not certain I wish to know, but it's dead-on accurate. "Revels are parties and those other words are dance steps. 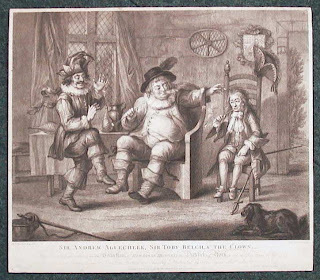 Sir Toby and Sir Andrew are all about eating, drinking and goofing off. It's what drives Malvolio nuts. And why, by the way, do you play that mean trick on Malvolio with the fake letter?" "Because he's so bossy!" Luis answers. "Exactly right. He's a real pip, telling you what to do, when to go to bed and pushing his weight around and what a fool...he thinks he can marry Olivia." "He makes me crazy," Geoffrey says. It's hardly a reach for these two to get into character. I'm not sure that's a good thing but it makes for excellent performances. "Geoffrey, do you have your harmonica ready?" "Yup." And he pulls it out of his pocket. "So, let's try some steps and I think we'll have you play your instrument on the exit when you get Andrew to kick higher and higher." On their own, the boys come up with a dance duel. Geoffrey starts with his "kickshaw." He clicks his heels together and nearly falls over but catches himself. Luis follows suit with a "caper" by throwing his leg up to the side and slamming the other into it from underneath. When Luis does his "back-trick" he stretches a foot toward the back of his head and then collapses forward as if wrenching his sciatic nerve. "Luis, that's great...really, that's a funny bit." "What?" he looks at me, genuinely clueless. "The joke you made about your back going out like that...it's good." "That wasn't a joke, Ms. Ryane. I hurt it." "Really? Gosh, are you okay?" "Yeah." And he rubs his back. "I thought you were acting. When an actor does something funny like that...it's called a 'bit'." "Hmmm. You think that's a funny bit then?" "I think it's a riot but I don't want you to hurt yourself, so if you want to keep it, let's do it safely." Got a huge laugh every performance. I was ready to bring a cow onstage for all the milking Luis did with that bit. Geoffrey matched him — bit for bit. He pranced around Luis in a circle — "My very walk should be a jig" — and the little kids in the audience screamed in laughter. I sat back and marveled. Some days all I have to do is show up. I achieved making the people laugh thise play and felt asome like a wave.